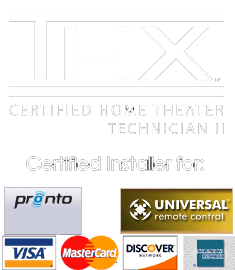 A well planned and executed home theater install is where it all starts. Experience has shown that installation and setup quality is at least as important as equipment quality is. Room acoustics, imaging, equipment ventilation, ease of use and manufacturer’s recommendations are all taken into consideration so you, our customer, experiences lasting quality. Our firm covers all the bases for prompt, high quality audio video installation services you can trust. From basic HDTV installs to extreme custom design projects, we have the skillset, tools and commitment to make you our next satisfied customer. Call 877 397 0468 for a quote.